New technology allows MRI scanning to be used to visualise the prostate and surrounding tissues in great detail. This technique is non-invasive and allows detection of lesions without the need for rectal access prior to biopsy. Fewer biopsy specimens are required. Increased detection of clinically significant prostate cancer. Reduced need for re-biopsy for men on active surveillance programs. A high strength, 3 Tesla, magnetic field combined with a multi-channel “Torso” coil provides high quality images of the prostate gland. This technology is known as multi-parametric as it provides sophisticated information relating to the T2-weighted image of the prostate, the diffusion of water molecules in a magnetic field and finally, dynamic contrast enhancement to detect neoangiogenesis (development of new blood vessels) which is a sign of malignant development. A 30 – 40 minute MRI examination evaluates the entire prostate gland and surrounding organs providing anatomical and structural information as well as detecting 4 separate tumour characteristics. This high field strength and associated magnetic “gradients” allow the collection of tumour specific information for tumours as small as 0.5 mL in volume. MP-MRI is calibrated to detect high-grade clinically significant prostate cancer rather than low-grade disease that does not require active management. 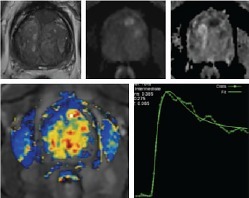 If lesions are detected and biopsy is recommended, multi-parametric MRI can also be used to guide prostate biopsy. This is a new alternative to TRUS biopsy and allows the collection of more targeted biopsy specimens, increasing diagnostic accuracy. Published results for lesions sizes > 0.5 mLs show increased detection of clinically significant tumours. Accurate MRI-based localisation and biopsy significantly reduces the required number of passes and sampling error. Certain regions that can be difficult to reach by ultrasound technique are now more easily localised using the MRI-guided technique. It has the potential to replace or reduce the requirement for the current practice of TRUS biopsy. MRI technology can effectively streamline management of patients with a raised PSA level or patients with a diagnosis of low-grade cancer who are currently managed on active surveillance programs which traditionally require multiple ultrasound-guided biopsies of the entire prostate gland. MP-MRI may help to select patients for surveillance, reduce the frequency of re-biopsy and, for patients who do require multiple biopsies, reduce the number of biopsy specimens that need to be taken. Studies have shown that for a lesion greater than 0.5 mLs, MRI-guided biopsy has a sensitivity of 86 – 93% and a specificity of 89 – 94%. This compares to a TRUS ultrasound detection rate of tumours between 6 – 10 mm of only 53%. MRI is a highly expertise-dependent service. 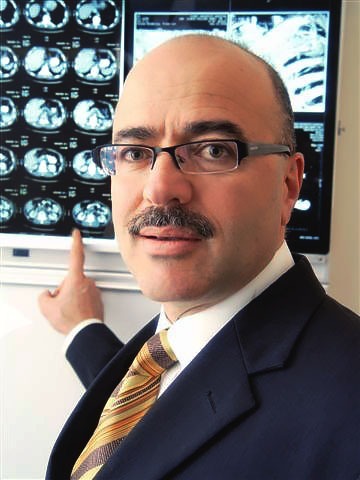 Dr Katelaris has one of the largest experiences in Australia with MRI diagnostic technology and MRI guided prostate biopsy. He was the director of the Prostate Cancer Research Division of the Institute of Magnetic Resonance Research and is now focused on the clinical application of MRI technology.